Finding a clearing after pervasive cloudiness much of the day, the Falcon 9 lit its nine Merlin main engines at 3:46 p.m. EST (2046 GMT) Thursday and climbed away from pad 39A at NASA’s Kennedy Space Center in the first daytime launch since May at the Florida spaceport. 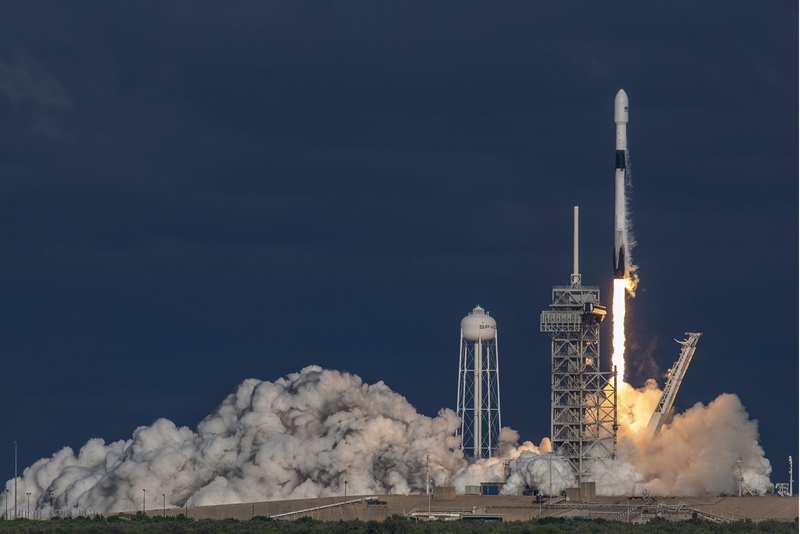 The 229-foot-tall rocket arced to the east over the Atlantic Ocean to send Qatar’s Es’hail 2 satellite toward an eventual perch more than 22,000 miles (nearly 36,000 kilometers) over the equator. Generating 1.7 million pounds of thrust, the Falcon 9’s kerosene-fueled first stage engines shut down around two-and-a-half minutes after liftoff, and the booster dropped away to begin a guided descent toward SpaceX’s drone ship parked in the Atlantic Ocean a few hundred miles east of Cape Canaveral. 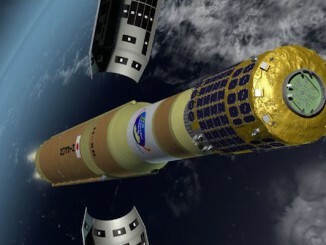 Aerodynamic grid fins opened near the top of the 15-story booster stage, and three of the rocket’s engines ignited to slow down for a scorching re-entry back into Earth’s atmosphere. In the final seconds of the booster’s return, one of the engines reignited to brake for landing, and four legs deployed from the base of the rocket. 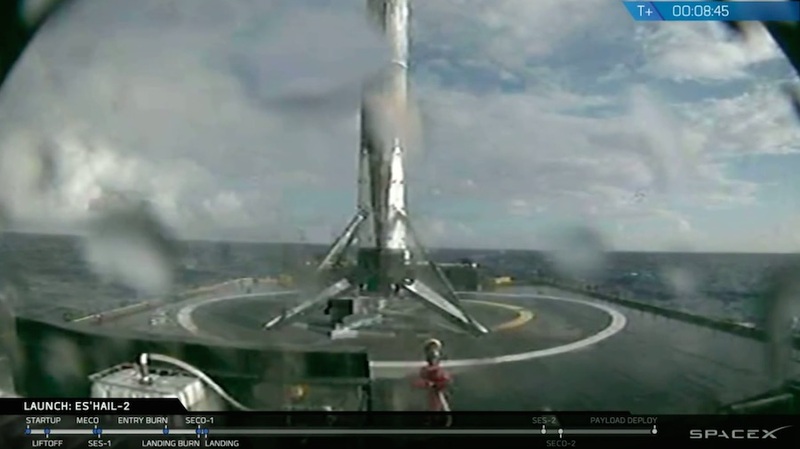 The rocket settled on SpaceX’s landing platform “Of Course I Still Love You,” the 31st time the company has recovered a booster after a launch toward orbit. Thursday’s flight used a previously-flown first stage that launched July 22 carrying a Canadian-owned telecom satellite, then landed at sea to be launched again. The successful landing after Thursday’s launch makes the booster available for a third mission. While the first stage came back to Earth, the Falcon 9’s second stage finished the trip into orbit, gaining enough speed to enter a parking orbit around eight minutes into the flight. After an 18-minute coast across the Atlantic, the upper stage fired its single Merlin engine again for less than a minute, aiming to send the Es’hail 2 spacecraft into an elliptical geostationary transfer orbit ranging between 115 miles (185 kilometers) and 22,369 miles (36,000 kilometers) above Earth, with an inclination of 25 degrees. SpaceX confirmed the rocket achieved an on-target orbit, and live video from the Falcon 9 second stage showed the Es’hail 2 satellite separating from its launcher over a South African tracking station around 32-and-a-half minutes after liftoff. Officials later said ground controllers received the first signals from Es’hail 2, verifying its health status in orbit. Es’hail 2 was built in Japan by Mitsubishi Electric Corp. and is owned by Qatar’s national satellite communications company, Es’hailSat. Equipped with Ku-band and Ka-band transponders, Es’hail 2 will provide television broadcasts, broadband connectivity and other services to Qatar and neighboring parts of the Middle East, North Africa and Europe. The satellite weighed around 11,700 pounds (5,300 kilograms) with its on-board propellants, according to Zoubair Kachri, Es’hailSat’s technical vice president. 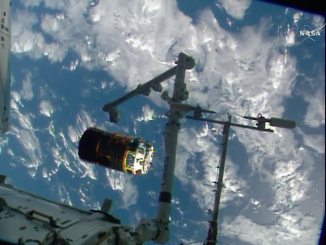 The spacecraft also carries the first two amateur radio antennas to fly in geostationary orbit, linking hobbyists across a third of the Earth’s surface in a single hop from as far west as Brazil and as far east as Thailand. 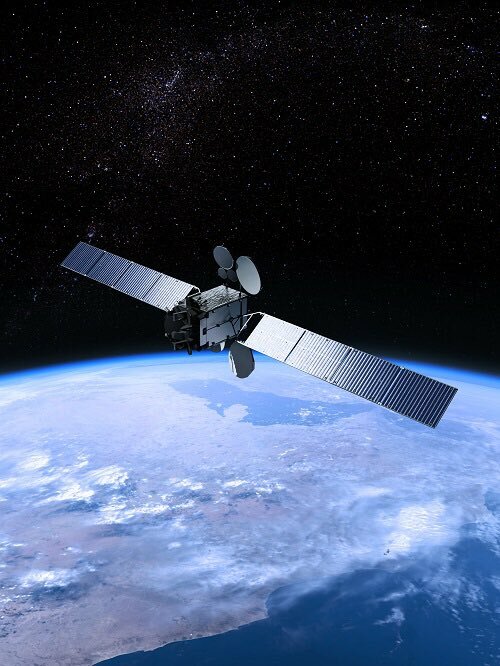 Es’hailSat said earlier this year that the new satellite features “sophisticated anti-jamming capabilities” to curb interference and will significantly expand the company’s offerings currently provided by Es’hail 1, which launched in 2013 aboard an Ariane 5 rocket. In a response to written questions, Kachri said Es’hail 2 will also further develop Qatar’s domestic space capabilities because the new satellite will be operated from a new control center in the country. Es’hail 2 also carries a dedicated telecommunications payload dedicated to the Qatari government and military, Kachri said, without elaborating on its specific uses. The satellite will use its own thruster to maneuver into a circular geostationary orbit more than 22,000 miles over the equator. Es’hail 2 will park itself at 26 degrees east longitude, where its orbital velocity will null out to match the rate of Earth’s rotation, allowing the craft to hover in the same position of the sky over the Middle East, Africa and Europe. Es’hail will enter service around the end of January to begin its planned 15-year lifetime. Thursday’s launch was the 18th by SpaceX this year, matching the company’s total tally last year. Four more SpaceX launches are planned by the end of 2018, and the next Falcon 9 flight is scheduled for Monday from Vandenberg Air Force Base, California, on a rideshare mission arranged by Seattle-based Spaceflight carrying 64 small satellites into polar orbit. Two Falcon 9 launches will follow Dec. 4 and Dec. 15 from Cape Canaveral’s pad 40 with a Dragon supply ship for the International Space Station and a U.S. Air Force GPS navigation satellite. On Dec. 30, SpaceX plans its final launch of the year from California with Iridium’s final set of 10 voice and data relay satellites, wrapping up a two-year-long sequence of launches to upgrade the telecom company’s previously-aging network. Meanwhile, work at pad 39A at the Kennedy Space Center will focus on preparations for the first test launch of SpaceX’s Crew Dragon astronaut transport ship. Developed under contract to NASA, the Crew Dragon could launch on its first orbital demo flight — without a crew aboard — as soon as early January on top of a Falcon 9 rocket from pad 39A. If the test flight goes well, a follow-up launch with two astronauts could happen as soon as June, again from pad 39A, which was once the starting point for crew riding Saturn 5 moon rockets and space shuttles. Nearby pad 40 will be used for most SpaceX launches originating from Florida in the coming months, while pad 39A is reserved for crew missions and satellite launches with the larger Falcon Heavy rocket. Thursday’s launch with Es’hail 2 was the seventh flight of a Falcon 9 Block 5 first stage, an upgraded version of the Falcon 9 rocket featuring reliability and reusability enhancements. SpaceX launched the inaugural Falcon 9 Block 5 rocket May 11 with Bangladesh’s first communications satellite. Officials heralded the successful debut as pivotal in allowing SpaceX to reduce the time and money needed to turn around a recovered booster for another mission. 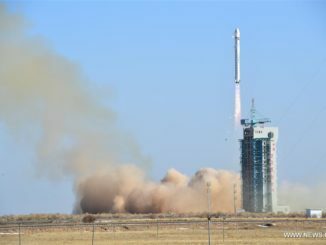 The first Block 5 booster from the May 11 mission was re-flown in August during the launch of the Indonesian Merah Putih communications satellite. SpaceX re-flew another Block 5 first stage last month on a mission carrying Argentina’s SAOCOM 1A radar observation satellite into orbit — following an earlier launch and recovery of the same booster in July. The launch with Es’hail 2 was the third flight to reuse a Block 5 booster a second time. SpaceX plans to take another step forward in rocket reusability with Monday’s launch from California, when a Block 5 first stage will be flown a third time, using the same vehicle that launched the Bangabandhu 1 and Merah Putih comsats earlier in the year. SpaceX chief executive Elon Musk told reporters in May that Block 5 boosters could be reused up to 10 times without refurbishment, and 100 times with periodic overhauls.